When Grapevine Group’s Debbie Knight accepted the Australia Day Award for Community Group of the Year, on behalf of the suicide prevention organisation, she had the opportunity on stage to quietly let Mayor Greg Williamson know about the results of his contribution to a major Grapevine campaign. “It was lovely that I had the opportunity to speak to the Mayor since we shared his video (on social media for the Be Suicide Alert This Christmas campaign) and I got to tell him how successful his had been!” Ms Knight said. “I quickly thanked him, then said: ‘I just wanted to let you know your video has had more than 10,000 views!’. Ms Knight said the campaign, which was launched in November and was published widely on social and digital media from December 1 to after New Year, attracted 34 business, civic and community leaders from all sectors of the region. She said while the campaign had been running for more than five years, this was the first year Grapevine Group had adopted such a high-profile approach. “This is the kind of campaign every single one of us in the community can be part of and we can all feel like we are making a difference. Grapevine Group President Laurence Manning thanked the community leaders for their support, while paying tribute to every single follower on social media who engaged with, liked or shared the posts. “In this case, every single click makes a difference. This saves lives. This makes people more aware,” Mr Manning said. 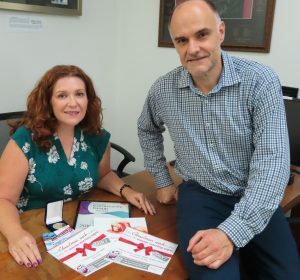 Mr Manning said the success of the campaign also helped Grapevine and its members achieve a bigger-picture goal in breaking down the stigmas surrounding mental health and suicide and helped to promote their vital free suicide prevention training. In February the group proudly expects to put the 5000th person in our region through suicide prevention training. “We are making progress,” he said. – The campaign achieved a reach of 218,748 just on the Grapevine page. (Additionally, organisations including Mackay Regional Council, Resource Industry Network and local elected representatives, shared the social media support graphics on their own pages which was not included in the count). – Community leaders contributed a total of 34 heartfelt videos urging the community to be suicide alert. – The videos were watched more than 60,000 times. – The region’s mayors, radio announcers, and local MPs were all strong supporters. – The Mayor’s video, alone, was watched more than 10,000 times. – Go to https://www.youtube.com/channel/UCTgWKJAp_e4uhubSU4SDI_A to see the videos.